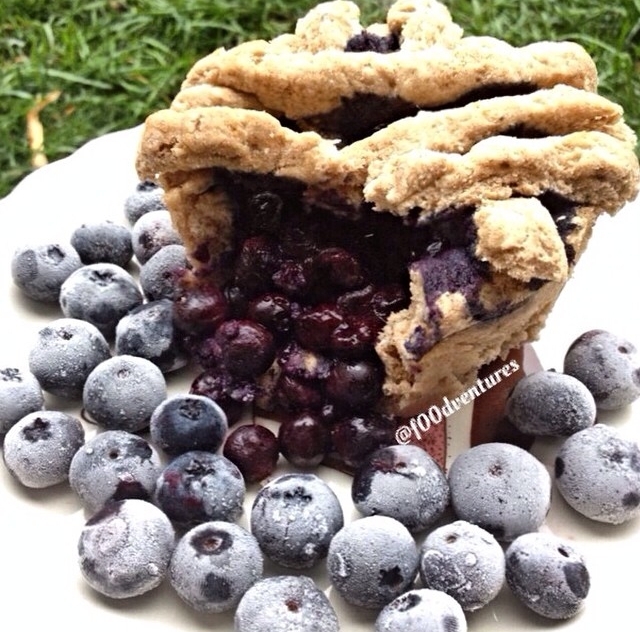 have you ever wanted blueberry but not wanted a whole pie? this recipe is the perfect single serve size, it's vegan, and it's made in about 5 minutes! for another pie flavor, switch out the blueberries for another fruit like strawberries, apple, peach, etc. Combine all ingredients except blueberries and mix well. Add enough flour so that the mixture is easily manageable I.e not sticky. Press 2/3rds of the mixture into a small ramekin. Form into a pie crust shape. Add your blueberries. Roll out the rest of your "crust" and cut into thin strips. Criss cross on top of your blueberries. Microwave ~1 min 30 seconds (or can bake at 350 degrees f for 20 minutes). You may want to put a plate underneath so the juices from the blueberries don't make a big mess. Let cool before enjoying!